Google Search used to have a handy feature that linked to the definitions of your keywords. Google initially linked to Dictionary.com, then it switched to Answers.com and to Google's dictionary service. 1. 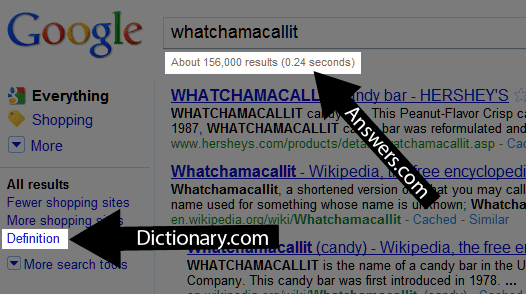 Use the Merriam-Webster subscribed link, which adds the definition of your query after the third Google search result. 4. Install the Google Dictionary extension for Google Chrome, which shows definitions by double clicking on a word. 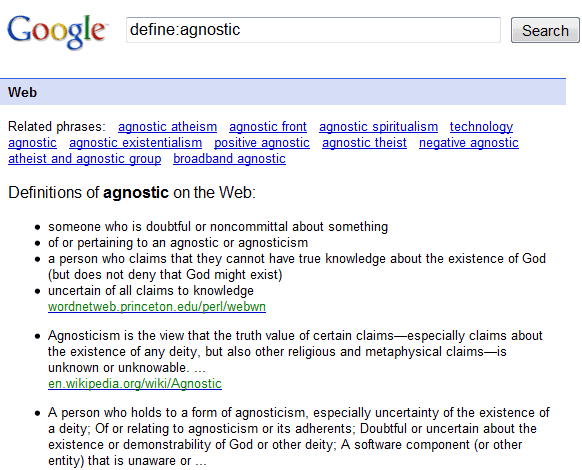 For Firefox, there's a great Answers.com extension, which shows definitions when you alt-click on a word. 5. Add Google Dictionary as a search engine for your browser. There's a search add-on for Firefox, but you need to manually add it to Internet Explorer by entering: http://www.google.com/dictionary?langpair=en|en&q=TEST in the URL field. In Google Chrome and Opera, create a new search engine, type: http://www.google.com/dictionary?langpair=en|en&q=%s in the URL field and add a keyword like dict. Next time you type dict moist in the address bar, you'll see the definitions from Google Dictionary. 6. Install a Greasemonkey script which adds links to answers.com and dictionary.com. "Google announced on May 5, 2010 it was rolling out a new layout for search results in which the major change was a new left navigation bar - however, along with those changes they decided to drop the "Definition" link that was originally on the upper right of the results page. They obviously dropped it because it wasn't being used that much, but I was one of the few users who used it all the time to quickly search Answers.com. In this script I've added in two links to the results page - one is simply taking over text that wasn't a link before and making it useful, and the other adds a link in the new left column navigation bar that takes you to Dictionary.com," explains the author. I tested the script in Firefox, but I think that the link from the sidebar is unnecessary. Fortunately, you can edit the code and remove it. I am using the Dictionary extension and it is excellent. The extension is configurable to allow different actions to look up a word. It can be configured to display a small popup on double-click or Ctrl+double-click. Alternatively you can highlight the word and then click the icon in the url bar to display an extended definition with links to other definitions. This is by far one of the best extensions I've used. It's unobtrusive, powerful, and extremely useful. Please bring this feature back!! "Next time you type 'dict moist' in the address bar,..."
Why not keep '[definition]' link from the old design, and have it target the query for 'define:[keyword]'? I really like the DictionaryTip extension in Chrome (aka Dictionary Tooltip in FF). Just double-click a word (or any shortcut key combo) and it pops up a small resizeable window. You can set the dictionary lookup site as well. 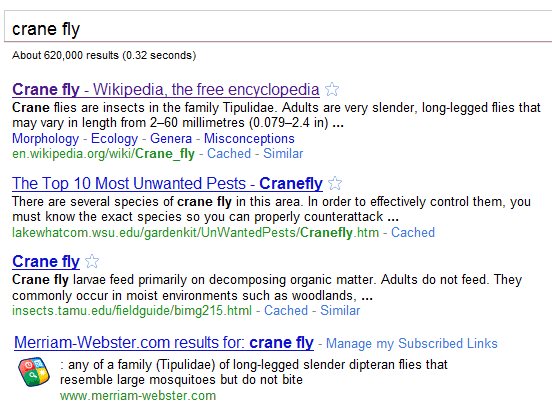 I set it to The Free Dictionary (TFD). TFD returns a lot of info including synonyms, antonyms, similar words, audio pronunciation, a translation feature, and tons of linked words and examples. Definitely my favorite extension. When searching Chrome extensions for the word 'Dictionary', DictionaryTip is several pages down. Not sure why exactly since most others ahead of it have lower ratings and fewer downloads. Maybe it's due to the name being DictionaryTip, instead of Dictionary Tip? I don't know, but it deserves to be much higher up the list. You can also try http://www.wordslike.net Its a great resource to find related words and their definitions. I need my linkified search terms back. I think Google may be overlooking the obvious. Simply having that link visible was extremely useful, without necessarily having to click it. If I Googled a word I wasn't sure of, just seeing the link told me it was spelled correctly (miss-spelled words gave no link), so there was no need to click it. Sometimes, of course, you need to actually look up a definition, or possible variants, but most of the time it was merely double-checking for a spelling error, which is passive and won't show on their statistics. I'm not a follower of this blog, and have never been here before. I spotted that the Definition link was missing, and Googled "Show Google Dictionary" in an attempt to find a way to put it back. I hate sidebars that scrunch the screen, and will never make use of it, no matter what they add to it, but give me that Definition link back where it was and I'll be happy as a clam. Well since Google starts to charge soon for calls to their dictionary API, I recommend using websites such as ours: http://hablaa.com offering free dictionary translations.